Webster University junior business administration major Josh Fleming, 21, is in rarified air. 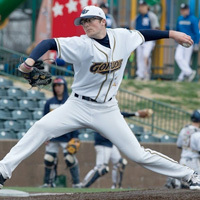 The left handed pitcher had his name called in the fifth round of the Major League Baseball draft, when he was selected by the Tampa Bay Rays on June 13. Fleming was the 139th pick overall in the draft. Fleming, a graduate from Columbia High School in Columbia, Illinois, was on solid footing entering the 2017 season, but an NCAA III-leading earned run average of 0.68, 115 strikeouts (second in the NCAA III) in 92 2/3 innings of work, and an 8-1 record made his stock soar higher. He is the first player on a St. Louis Intercollegiate Athletic Conference (SLIAC) team to be drafted by the MLB in 19 years, and only the second SLIAC baseball player to ever be drafted. At Webster, he is a junior studying business administration in the George Herbert Walker School of Business & Technology. Charlie Meyer at blogofprospects.wordpress.com had rated Fleming the fifth best player in Missouri, colleges or high school, eligible for the 2017 MLB draft. "I'm just really excited about the prospect of becoming a professional ball player," Fleming said. "The thought of baseball becoming an everyday job for me is very cool." The MLB draft started on Monday June 12th with rounds one and two, including two 'competitive balance' rounds. June 13 saw rounds three through 10, with June 14 to cover rounds 11 through 40. Approximately 1200 players will be drafted when activities are completed. Typically, 10-20 NCAA III players are selected each year in the MLB draft. In 2016, the highest round an NCAA III player went was in the fifth round as well. Fleming's 2017 season got the attention of regional and national outlets. He first earned the St. Louis Intercollegiate Athletic Conference "Pitcher of the Year" award, then was named the d3baseball.com 2017 Central Region 'Pitcher of the Year' and to the d3baseball.com All-Central Region First Team. The American Baseball Coaches Association followed with ABCA/Rawlings 2017 Central Region 'Pitcher of the Year' recognition for Fleming, as well as being named to the Central All-Region First Team. His recognition reached the national level as he was the d3baseball.com 2017 'Pitcher of the Year,' while landing on their All-American First Team. Fleming was also ABCA/Rawlings All-America First Team, just the second player in Webster history to earn a First Team spot. He is now eligible for ABCA/Rawlings 'Player of the Year' consideration. Fleming set Webster single-season marks for ERA and strikeouts, and allowed the second lowest batting average for opponents (.165). Fleming has the lowest career ERA in team history (1.92), and is second in strikeouts (251) and fourth in wins (19). Webster head baseball coach Bill Kurich noted, "Pitchers usually lose it for a few innings in a few games, but I don't remember Josh losing control of any game for more than a pitch or two. He'd be able to correct himself in a pitch." The only player to be taken in the MLB draft previously from a school competing in baseball in the SLIAC, was in 1998 when Fontbonne University's Ryan Bauer was picked in the 26th round. Read more about Gorlok sports at the Webster University Athletics site.